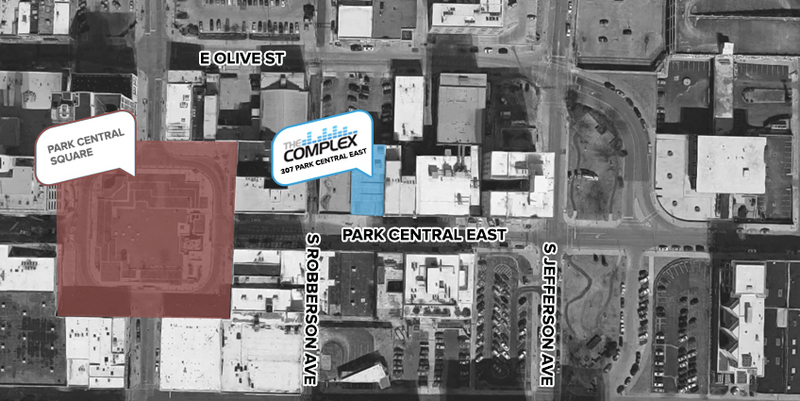 The Complex (formerly Regency Live) is a live music and entertainment venue in downtown Springfield, focused on national / international touring artists. The Complex Live, which took ownership in February of 2018 has been producing live music events since 2010. They have produced concerts with artists from A$AP Rocky to Zomboy and everyone in between. With over 1000 events under their belt, The Complex is committed to bringing you an amazing live music experience. The history of 307 PCE is legendary. Home to The Regency for 16 years, Icon for 9 years and Instinct for 3 years, 307 PCE boasts the title as Springfield's longest running, entertainment venue. The venue encompasses two spaces: the main floor and VIP Mezzanine Lounge. Each space has its own entrance and exits, bathrooms, bars, sound and lighting. Total venue capacity is 850. The Complex's interior boasts sixteen-foot ceilings with black rock pillars, glass and chrome balcony railings, white leather furniture, walls and titled columns-illuminated by vibrant LED lighting. The venue's large glass roll-up doors open up the facade, joining the front lounge and patio for an enjoyable indoor-outdoor experience. No weapons of any kind. No outside food or beverage. No drugs or drug paraphernalia. No professional photography / videography without a Media Pass, point and click cameras are okay (Subject to change). No bags bigger than a purse. No markers or pens. All patrons are subject to search. Patrons who are clearly intoxicated or under the influence of drugs will not be admitted. There is no re-entry once admitted into an event. The Complex benefits from ample street, lot and garage parking, throughout the downtown district. Bring your Print at Home ticket or show your Mobile ticket on your phone at the main entrance to gain entry. Your ticket will be scanned in at the door. Print at Home tickets can be shown on your phone if you don't have a printer. Please have the brightness on your phone turned all the way up to ensure scanability. If your phone dies or your Print at Home ticket is damaged, The Complex can look you up with your valid ID, as long as the tickets are in your name. Tickets should not be purchased from a third party website like Vivid Seats or StubHub. The Complex can't authenticate tickets purchased from a third-party vendor. Tickets should only be purchased from the websites and outlets listed on each event page. Valid GA tickets can only be purchased online from showclix.com. *This doesn't include VIP or Meet & Greet tickets sold by a band directly or by their fan club. Age limits vary for every event. Please check the event page to see what the age limit is for the show you're coming to. If an item is turned into The Complex or found by The Complex staff, it will be placed in on our lost and found. Please call 417-238-4474. Items are discarded after 2 weeks. Confiscated IDs are destroyed immediately. The Complex is a STANDING ROOM only venue. Seated events are very rare. Please plan to stand for the duration of the time you are at an event at The Complex. Tour VIP Packages and Meet & Greet s typically happen 1 to 2 hours before the show. You will receive an email from the tour with information and directions. There is no smoking or vaping indoors at The Complex. Please use the designated smoking patios to smoke or vape.